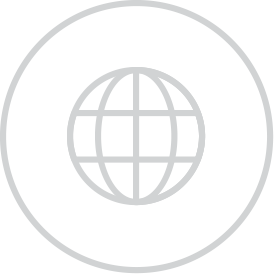 Looking for nonstick grill plates that last? Our nonstick copper color plates are 5x more durable1 and make cleanup fast and convenient. That’s just one of the ways the George Foreman® 4-Serving Copper Color Removable Plate Grill and Panini Press speeds up the cooking process. With 35% faster heat up* and consistent grilling temperatures, this grill delivers easy-to-make meals in just minutes. When you want to spend less time cooking and cleaning, and more time enjoying your meal, turn to your George Foreman® Grill. Easy cleanup is essential, and that’s what the copper color removable grill plates are all about. Pop them in the dishwasher after grilling and they’ll be ready to go for your next meal. Time for an upgrade! Our copper color grill plates are 5x more durable1, dishwasher-safe, and free of PTFE and PFOA. 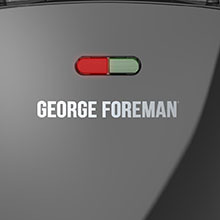 It’s the sure sign of a George Foreman® Grill. The sloped grilling surface helps remove up to 42% of fat** for tasty meals. 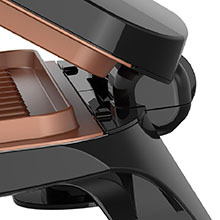 The 1” floating hinge seamlessly adjusts for thick burgers and sandwiches. Food in record time! This grill cuts down on the preheat time so you can start cooking faster*. 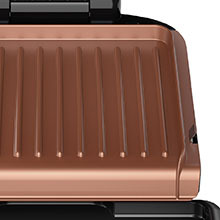 4-Serving Copper Color Removable Plate Electric Indoor Grill and Panini Press is rated 4.5 out of 5 by 33. Rated 1 out of 5 by Timothy L from Copper Plates are no good! This is the second George Foreman grill i have purchased. The first one also was non stick and could never come clean after the first month. I thought the copper plates would be better. Nope. Again after one month they are uncleanable..tried soaking, using water soaked paper towels - nothing works. it is now filthy and cannot come clean.. Rated 1 out of 5 by davidb1989 from Non-stick coating gone after 12 uses I bought this grill as a replacement for a previous generation because the nonstick on the old one eventually wore off after a 1 and 1/2 of use. This had promise with the new copper coating as it was much easier to clean but now I have food stuck to the plates and am unable to get it off! I am not rough when I clean these plates. I use the gental non scratch 3M sponge to wipe it clean. Now no matter what I try I have a perminent layer of food stuck to the plates! I tried the dishwaser and soaking to no availe. I loved this girll because I live in an aparment with no access to grill outdoors. It was a fast way to cook but now I will not be buying another Foreman Grill until they re design the non stick be as durable as it is in my pots and pans. Rated 1 out of 5 by Moses from skeptical about the improved plates? 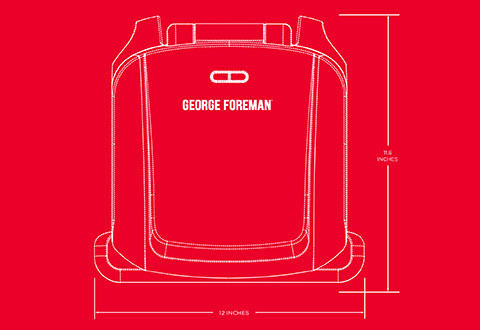 I have owned several Foreman grill's 5 total and loved them for there convenience and quick and even cooking. BUT!!!. Everyone of them Started bubbling and peeling off the Teflon non-stick coating. The last one started bubbling within 6 months. I have all ways purchased the Walmart 2 year warranty for this reason and this last one I purchased they had lowered the price by 8 cents yes 8 cents and it didn't qualify for the 2 year warranty and as I said it bubbled with in 6 months. The previous grill was replaced by Walmart but they wouldn't replace it again and i had to go threw a free 1 time only refurbished/re-coated plates from some second party threw Walmart (didn't last a year) it bubbled and peeled as well. So with all this being said I am skeptical about the new as they call them COPPER COLORED plates, are they copper? Will they Bubble? Will they peel? I will just have to wait and see. As for there other plates the Ceramic plates on there more expensive grills other reviews have said they start to crack over time. One other note I never put the plates in the dishwasher they were hand cleaned and with soap and water and a soft sponge after soaking in hot water. Rated 5 out of 5 by Resident from Purchased myself to aid with weight loss Bought yesterday and used yesterday. Pleased with purchase. Tell me though, what does it mean to have copper "color" plates? How are they more helpful than the traditional black plates? Rated 5 out of 5 by Kasia from Wonderful Grill Perfect for small family This grill is seriously amazing. I normally do not write rave reviews but this is gonna be exemption. First of all the plates are removable, and are super easy to clean up which is most important for me ( since I am the one that does the clean up - after my husband grills something ), little bit dish soap and everything comes right off without scratching the surface. Second is that this grill cooks very evenly ( which is not usual for those ), as on our previous ones we would get different temperature readings through out the meat, this one is just great on all the portions. It will easily feed our family of 3. Plastic part does not get hot when in use, which is great if you have little kiddos, and also the whole grill after being plugged out gets to regular temperature pretty quick. So far we have tried making all sorts of meats : steaks, ribs, chicken, and sausages. 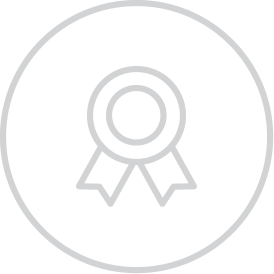 Great for house use, apartment or even college student. Rated 5 out of 5 by Asianchristine from Weeknight Meal Saver This mini grill is a lifesaver. I can throw on a marinated chicken breast and have it cooked up in no time for dinner when I get home late. I don't have to use my grill outside if it's too cold out and grilling is healthier than frying. It's easy to clean and nothing sticks to it which is great for cleanup as well. This is easy to store and I can pull it out whenever I need it. Rated 5 out of 5 by MPattiso from Great item to use I love the George Foreman 4-Serving Copper Color Removable Plate Electric Indoor Grill and Panini Press. This item works excellent. 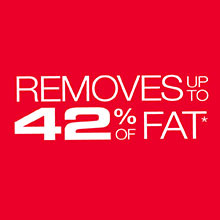 We love to use it, especially on cold days to either make a nice warm sandwich or use a grill inside. I would definitely recommend it. Rated 5 out of 5 by Macmammyjen from Awesome grill! I absolutely love this grill!It is so easy to use and making paninis on it was great!Clean up is a breeze with the removable copper grills,nothing sticks to them!